In 2016, we wooed, persuaded, and stalked the Bay Area's most talented chefs to convince them to share the recipes for their restaurants' signature dishes. Here are the 20 recipes our readers dug the most, compiled into an ultimate cookbook for your at-home culinary pleasure. Shiso is an herb often found in Japanese cuisine. It tastes slightly citrusy and herbaceous, like a cross between mint and basil. There are plenty of uses for the versatile plant—pickle it, use it as a wrapper for meat or fish, or use it as a garnish (in Japan it's often used as a vehicle to hold wasabi)—but if you're at Ichi Sushi, you'll find it cleverly turn it into a pesto and tossed with somen noodles. Replicate the colorful dish with the super simple recipe below! Note: you can find yuzu and shiso at most Japanese markets, such as Nijiya in Japan Town. 1. Bring 2 quarts heavily salted water to a boil. Add noodles and stir once, then leave to cook until al dente. 2. Strain and then plunge into a bowl of ice water to cool. Strain again and set aside, refrigerating until use. 3. Combine shiso leaves, oil and salt in a blender. Pulse until smooth. 4. 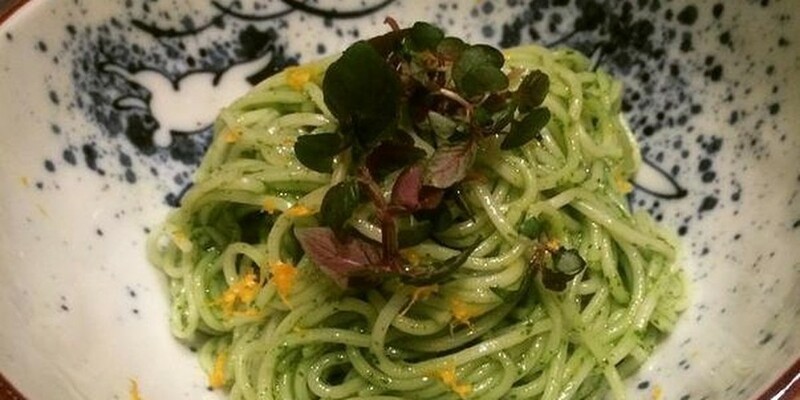 Dress noodles with shiso pesto, then mix in yuzu juice. 5. Serve either on plates or in a big bowl, family-style, garnished with lemon zest.